Mindanao, in the southern Philippines, consists of a large landmass and series of smaller islands that cascade across the Sulu Sea towards Malaysia. Its east coast and interior is home to a number of different indigenous people whose textile traditions share technical and material features, including the use of abaca fibre, ikat dying methods and the use of backstrap looms. Although technically similar, the textiles display patterns and motifs designed to meet social or spiritual functions specific to each community. In some cases motifs reflect a deep respect for local flora and fauna and are believed to act as conduits to the divine. Other textiles are designed as ceremonial gifts on occasions such as marriage, or are hung to designate spaces of spiritual importance. Much of the west coast and archipelagic parts of Mindanao are home to Muslim communities who have strong links with early seafaring Sultanates that resisted Spanish imperialism. They share cultural and religious practises with neighbours in Malaysia, Brunei and Indonesia and are renowned for their architectural woodcarvings. Over the centuries, international and local trade introduced new materials and modes of production. This led Mindanao’s artisans to abandon some materials and adopt others to create innovative textiles and crafts for exchange between the region’s diverse communities. This type of textile is called 't'nalak'. It is made from the fibres of the 'abaca' plant ('Musa textilis'), which is a species of banana plant native to the Philippines. Traditionally the stalks of the plants are cut and the layers are separated by rubbing them between that hands or feet until the individual fibres are exposed. The rough fibres are immersed in water for cleaning and softening and are later beaten and left to dry. Once completely dry, they are woven together to make yarn. T’boli weavers are sometimes referred to as ‘dream weavers’ because they are said to reproduce patterns bestowed on them in their dreams by their supreme deity, Fa Dalu. While the patterns of the 't’nalak' textiles are varied with over 100 patterns they are based on the repetition standardised motifs. The zig-zag ('sigul') forms an integral part of T’boli textile design and is used in combination with other geometric shapes to create pictorial motifs like the crab ('kleng'), the python skin ('sawo'), the shield ('klung') and the frog ('tofi'). This textile appears to feature a series of segregated motifs including the crab (kleng), frog (tofi) and shield (klung). In conjunction with their geometric patterning, t’nalak textiles exhibit a cosmological colour scheme. The white or undyed motifs usually take the form of humans or animals and are the most cosmologically significant part of the design. The use of red is secondary and is seen to provide a complementary colour to the white motifs. Black is regarded as the least important and serves only as a backdrop to the white and red patterns. 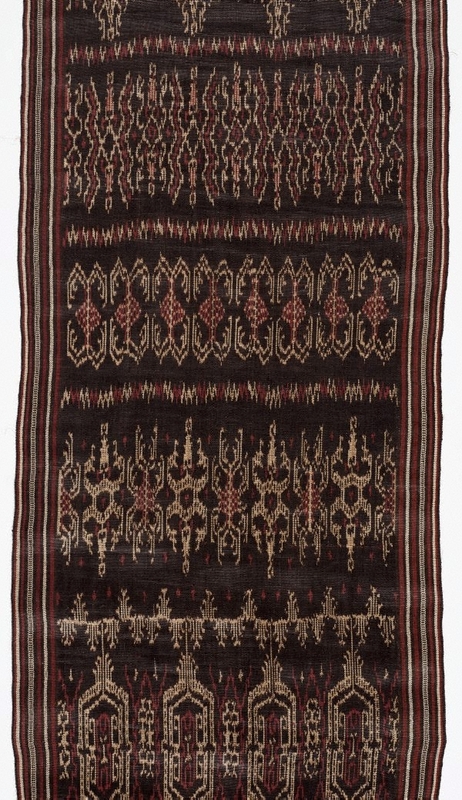 The patterning on this blanket is produced via the warp ikat, which means that the warp threads (the yarns tied to the loom) were tie-dyed before weaving the cloth. 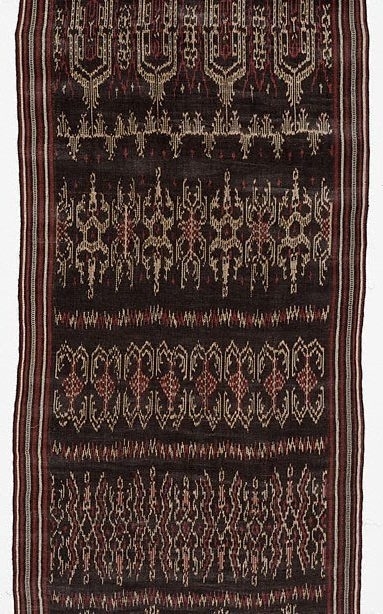 This gives the pattern the pixelated appearance associated with the ikat technique.